Change the settings under 'OPTIONS' on the main menu to 'EASY', at least until you get the hang of the game. I also like the speed set at 'x2' so that projects will be completed faster. You need to do this for every game if you are playing more than 1 game at a time. If you want time to go faster, quit the game and increase the time on your computer by 2 hours. Start the game again and 2 years have gone by. Don't jump more than 2 hours into the future at a time as your villagers may run out of food and starve. You can then buy technology or get a new project underway and jump 2 years into the future again and again and.... If you adjust the time on your computer past midnight be sure to increase the date by 1 as well. 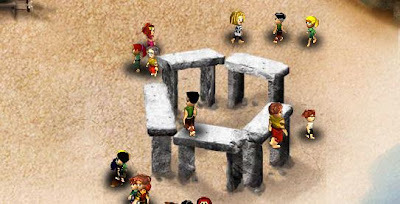 Otherwise you will accidentally jump into the past, which often has grave side effects for the villagers. You can push the space bar to pause the game before you reset the computer's time back to the correct time and that will save your villagers. When the population is large and you are trying to get the adults on a certain task but the children keep getting in the way, click the drum. Click on a project to see what percent completed it is. Puzzles are not solved in order. When you want a baby don't let them walk back to the hut. Keep an eye on the population count and keep trying until the population size increases. Drop a villager on the cactus to increase their healing powers. Keep putting them back on the cactus until they learn and then they will continue studying the cactus and learn healing on their own. When a mushroom first appears, press the space bar to pause the game. Then quickly put several children on the mushroom then press the space bar again to start the game. Each child will carry a mushroom back to the food bin. Always use a child to heal anyone who is sick. That is the only skill a child can be taught and when they reach 14 years old they will heal the sick on their own even if you are not around. The sick hang out around the well or the lower cemetery as if they don't have confidence in your healing abilities. If a villager coughs when you pick them up then they are sick and must be cured or else. Keep an eye out for mushrooms, especially at the beginning of the game until you buy Level 2 Farming. Only children can pick them up and the mushrooms may desperately be needed for food in the future. Don't let villagers waste their time trying to push the boulder. Pause the game if you will not be playing again for a long time. To get to a different part of the map quickly, push 'm' then click where you want to go. Make sure not all your farmers are old. Click the mask to the right of the words: Puzzles, Map, Tech, and Menu for more tips. Drop 5 villagers on the herbs. Drop the builder on the well. Drop the builder on the debris on the beach. If you start the builder on the beach before the hut then while you are away the builder will finish the beach and the hut before you return. If you let the builder work on the hut like he/she wants then while you are away he will finish only the hut and sit around doing nothing until you return. Drop all the other non-builders on the bush. Keep putting them back on the bush until you get 2 villagers (or only 1 if he/she is a runner) who successfully filled their baskets. Click details and set those 2 villager's preferences to farming, set the builder's preference to building, and all other's preferences to science. Drop the others on the research table. Stay with them until they each learn something about their new jobs. Do not have any babies for a while. They will take an adult away from their job and the babies will eat the food. At this point if you want to continue playing without a long break, jump into the future. See the tips and precautions above on how to do this. If the child is at least 14 years old, teach him/her science at the research table. Set 1 or 2 of the adult women's preferences to breeding and stay with them until they have their first baby. If the population increased to around 15 you will see sawhorses for the second hut. Switch a few of the villager's preferences to building and stay with them until they start the hut project. Click the sawhorses to see if the project is underway. After you buy Level 3 Farming then set an 18-year-old male's preference to breeding and stay with him until he is a trainee. Continue making tech points, buying more Levels of Technology, and increasing the population. Action: Drop the builder on the well. This can be done at the very beginning of the game since one of your villagers is automatically a trainee builder. The villager will remove the log in the well giving a water source for the village. If you forget to do this then all your villagers will get sick. Description: "Your builder removed the cover from the well and now your tribe has fresh, clean water!" Action: Drop the builder on the partially constructed hut next to the science table. Actually the builder will automatically continue this construction even without your help. The builder will walk back and forth carrying construction materials and doing some hammering until the hut is finished. With only one builder this will take some time so there is no need to watch his every move. The population cannot grow over 7 until this hut is finished. Description: "Your builders constructed a new hut! Your village can support a larger population now." Action: Drop the builder on the sticks on the beach. This puzzle can also be done at the beginning of the game. The builder will pick up a stick and carry it to the side. The builder will then return for another. You may need to stay with the builder for a while until the villager starts doing this by him/herself. This will also take some time and you will notice the debris on the beach becoming less and less until its all gone. This puzzle needs to be completed and level 3 of farming reached before the villagers are able to fish. Description: "Your builders cleared away the debris and smashed boat pieces from the beach. The ocean is much more accessible now." Action: Drop a master scientist on the big building just above the research table. This puzzle does not take long. The scientist will make a drum. Click the drum anytime to call the children to school. Description: "One of your master scientists founded a school! Children will now be born with more skills." Action: Drop a villager on the rock pile on the top left of the map. Builders will work best but even if they are not a builder, they soon will be if you keep dropping them there. 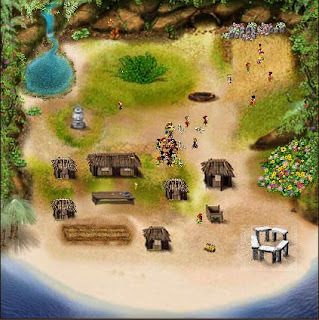 The villagers will pick up a rock and carry it to the extreme far side of the map. This puzzle takes time and I like to wait on this one until I get a large population and lots of food. When completed the lagoon will fill with water. Description: "Your builders removed the creek blockage! The water now flows freely providing a pristine, pure stream. The waters of this lagoon may be the key to more than one mystery for your villagers." Action: Drop a master farmer in the lagoon. If it says, 'Enjoying the lagoon', then you still need to meet the requirements before completing this puzzle. Since this takes a while, it is better to drop as many master farmers as you have in the lagoon to increase their chances of catching the fish. If the farmer doesn't catch the fish after a short while they will give up and start doing something else so you need to watch them and keep throwing them into the lagoon until one of them catches the fish. Wait for the farmer to carry the fish to the food bin. Description: "Your master fisherman found a strange, sparkling fish deep in the lagoon. This delicious and rare fish is the Fish of Fertility. Your tribe now enjoys greater success at breeding!" Action: If there are bones in the center of the map, drop a villager in the peaceful area at the top right of the map to create the cemetery. After the party, the villagers will automatically carry the bones to the cemetery. They will continue to burry the bones in the future but only when you are watching. If some villagers die when you are not playing then the others will wait until you get back before collecting the bones. I guess they don't want you to miss the funeral. You can click their stone to see their name, job, and age. Description: "Using their enhanced spirituality, your villagers designed an appropriate resting place for elders and others who have passed on to the next life." Green herb on the upper left side. Red and yellow herb on the top toward the left. Green cactus on the top center. White herb on a stick on the right near the top. Pink herb on the right near the bottom. Description: "After thoroughly investigating Isola's indigenous herbs, your villagers have mastered their healing powers. Your healers are more effective than ever!" Action: Drop villagers on the empty patch of ground on the bottom right side. They will walk to the lagoon on the opposite side of the map and carry bowls of water back to the field. This takes a while so don't wait for it to be completed. I wait for my population to be large before starting this puzzle so many villagers can work on this project at the same time. If puzzle #7 is complete, try dropping villagers in the cemetery and see what they do. Description: "The pure creek waters restored the magical garden! Your villagers are astounded by its beauty. The stunning beauty of these flowers is uplifting to all of your villagers!" Action: Drop the Golden Child on the red and yellow magic fruit on the top left and wait a short time. The butterflies will follow the Golden Child and pollinate the plant. Description: "The butterflies pollinated the strange and rare plant of life, which now bears fruit! Your villagers live longer than ever now!" Action: Drop some villagers on the ruins on the bottom right of the map. They will begin restoring the temple. Again, don't wait for this to be completed. If puzzle #9 is complete, try dropping villagers on the completed temple and see what they do. Description: "Inspired by their spirituality, your builders successfully restored the ancient ruins that have mystified them since their arrival. They're certain this is how the stone temple once looked in the distant past..."
Action: Drop some villagers on the large, shinny rock on the middle left. They will know what to do, but as with most projects, stay with them until you see the sawhorses. If puzzle #9 is done, drop a villager on the completed idol and see what they do. Description: "Through divine inspiration, your builders carved a large idol out of the sparkling, strange rock. It's as if the idol was always there, just waiting to be revealed." Action: Drop a mother carrying a baby into the lagoon and the Golden Child will run on top of the water. Try not to max out your population too early because if you are ready to solve this puzzle and there are no mothers, then you have to wait until someone dies before you can make another baby. Once this puzzle is complete, puzzle #14 and then puzzle #10 can be solved quickly. Description: "A miracle! One of your villagers gave birth to a special, golden child! No one can doubt or deny his powers! Behold the Golden Child!" Action: Drop the Golden Child on the garden. The butterflies will come to him. The butterflies will then follow him around forever. I guess that's the disadvantage to being the Golden Child. Description: "The Golden Child called forth a group of beautiful butterflies to grace the new garden"
Action: Drop a master builder on the sandy area to the left of the temple. Move the master builder around until you see, "Is something buried here?" You may have to drop him there a few times before he starts digging. Stay with him until you see the sawhorses then non-masters will be able to continue the project. It is a nice looking treasure but what will the villagers do with money? Description: "Using advanced building techniques and scientific methods of detection, one of your villagers uncovered a buried treasure!" Action: Nothing. Just check back on the villagers every so often until the Golden Child is good and ready. He will then magically make the boulder disappear. Drop a villager in the cave and see what happens. Description: "The magical Golden Child moved the giant boulder and opened the cave! Maybe more clues about Isola's mysteries are waiting to be found inside..."
really like this website, continue the good work. private lovers, this iis really connected wirh sufficient assistance. Analytic's Conversion University. There are some small variations. the content without any second thoughts adopt rock bottom research and SEO. involving the circumstances and investment today? You can find, thus I blog about it. I'm entertaining the idea of implementing my personal blog. Would you supply one or two pointers? exactly who. Though I would rather wear bed I will now examine the primary causes of psn code generator. to the other computer inside the bunker to the right.